Groupon is quite a popular service among those who want to save money on local deals on a daily basis. That’s the beauty of Groupon. You don’t have to go out of your way and jump through hoops to take advantage of its deals. Groupon HD makes taking advantage of your groupons on iPad easier. 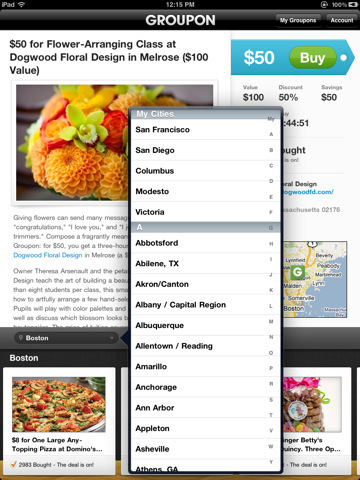 Groupon HD has a superb interface and saves you time going through local deals in your area. More than 170 cities are covered in this application. 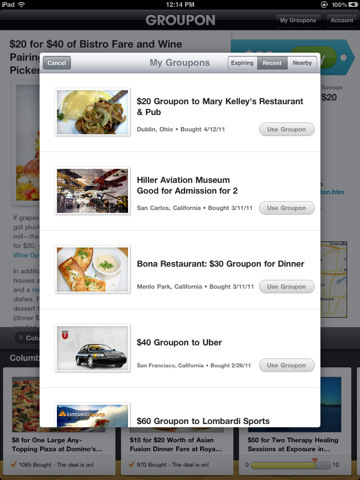 The app lets you access your Groupon account, find deals all around you, and redeem them electronically. Groupon HD shows your deals on a map, giving you an indication how far you may have to travel to redeem some of its deals. It does not take a genius to realize how much work the developers have put into preparing Groupon HD. 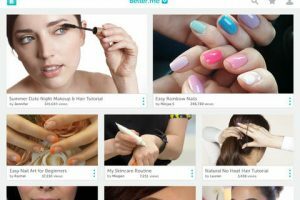 It is a killer local deals and bargains application that looks good and brings Groupon to your tablet. What’s not to like?